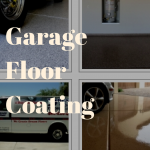 Dreamcoat FlooringBlogCurious About Metallic Epoxy Floor Coatings? You’ve probably seen these striking metallic floors at high-end stores, in nightclubs, fancy offices or other commercial buildings, or perhaps at a friend’s home in their garage or basement. Wherever you see them you are sure to notice them because of their beautiful sheen and sparkle. Each metallic epoxy floor is unique, because of the multi-step process required to produce it. We get a lot of questions about these floors and how we create them, so we decided to share the most common questions here in our blog. Q: What are metallic epoxy floors? A: These stunning floors are created by applying a metallic top coat (sometimes in a contrasting color) over a solid epoxy metallic base coat. The layering of materials produces a spectacular three-dimensional appearance. The epoxy is comprised of a resin and a hardener, mixed together to create a very durable material. The addition of metallic powder creates the unique pearlescence, providing rich color, high-gloss and variable visual effects. 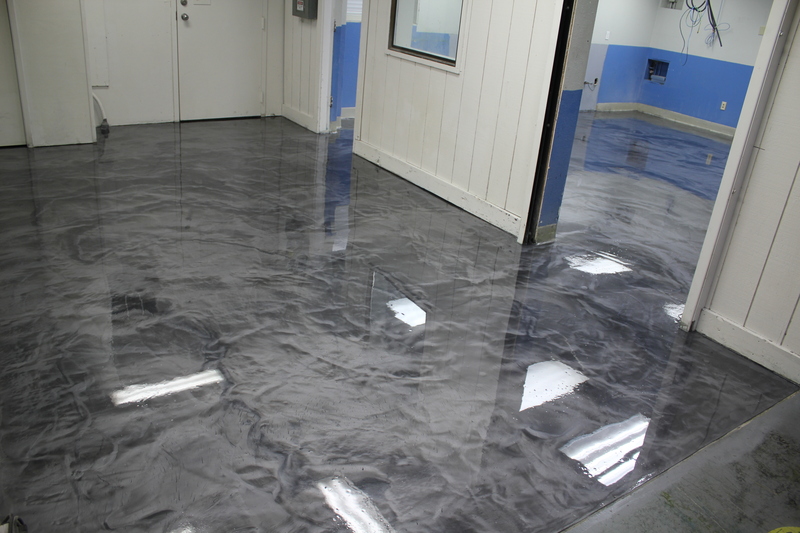 Q: Are metallic epoxy floors durable? A: Yes, they are just as resistant to salt, oil, acids, chemicals, water and wear as our other high-performance epoxy floors. We use only top-quality resins and hardeners, and our skilled technicians take care to do proper prep work, so that your floors remain beautiful for years. Dreamcoat Flooring is known for its custom work because of the talent we have on our team. Q: Can I buy a kit and install my own metallic epoxy floors? A: If you are a fan of DIY, you can certainly find epoxy floor kits for purchase at home renovation outlets and give it a go yourself. However, you should probably understand that the products available for consumers to purchase are not nearly as strong as the commercial products that we use. We always recommend professional installation over DIY for this reason. Q: What kind of problems can occur with these floors? A: The most common epoxy floor problems result from incorrect installation. If the substrate isn’t prepared correctly the floors can peel or bubble. Air bubbles in the epoxy are also problematic if the resin and hardener aren’t mixed properly or in the right proportions. Inconsistent or patchy color can also happen if you don’t mix properly or if you must run out and buy more product because you didn’t have enough to finish the job. If you want a top-notch finish, we firmly believe that you should rely on a professional to do the job. Q: Are metallic epoxy floors expensive? A: They are a bit more costly than regular epoxy floors because the materials are more expensive, and the process requires more coats and can involve some specific artistic techniques, unlike plain epoxy. Our metallic floor coatings start at $4.50 per square foot. Q: I have a very specific vision for my floors, can you customize my floor to my wishes? A: One of the biggest benefits of metallic epoxy floor coatings is that the possibilities for customization are almost endless! The business, office or home. Custom floors are our passion, together we can create a floor you’ll be proud of. The range of colors is infinite, and we can employ different creative methods to produce whatever effect you can imagine. Want your surface to look like you’re walking on the moon with pits, crags and craters? Maybe you like the idea of treading on waves or striding across galaxies, tell us your idea and we will make it happen. We finish off your dream floor with a high-gloss coating that imparts high style to show off! Q: How long does do metallic coated floors take to make? 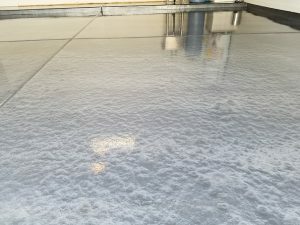 Because of the multi-coat process required to produce complex visual effects such as swirls, ripples, craters and other three-dimensional looks, metallic epoxy floors take a little more time to install and cure than a regular epoxy floor coating. You can expect the process to take 4-5 days to complete. Q: What time of year is best for installing epoxy floor coatings? A: Some DIY products can only be used within a small temperature range, but the commercial grade epoxy floor coatings that we install for our customers are formulated for use in a wide temperature range. 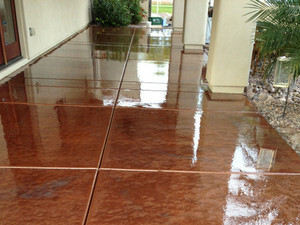 Here in Arizona, with our warm, dry climate, we can install our products year-round. Q: Will my metallic epoxy floors yellow with age? A: Some epoxy coatings are prone to yellow with age if the floors are exposed to sunlight – usually after several years of daily exposure. As we live in a sunny climate, we recommend a coating of UV resistant urethane on lighter colored floors that get direct sun. Dark floors generally don’t require UV protection from the yellowing effect of the sun. Q: Where can you install these floors? A: We can install epoxy floor coatings (metallic or regular) over non-porous surfaces, but not formica or tile unless we remove these and patch the concrete, which adds to the cost. 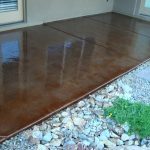 They can be installed indoors or outdoors, but when coating an outdoor space, we always recommend adding a traction component to the floor in case the surface gets wet. 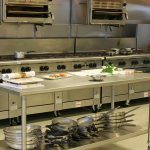 Take a look at some of our projects for inspiration. Q: Are metallic epoxy floors slippery? A: Any epoxy flooring can be slippery when wet. If you are installing these floors in a bathroom, a garage or any room that is frequently wet, we recommend adding an anti-slip component to the epoxy to provide grip. Ask us about it! Q: What kind of maintenance do metallic epoxy floors need? A: Taking care of your metallic epoxy floor is simple but if you want it to look as great as it looks after being installed, you will want to clean it often . To fully enjoy the gorgeous color and shimmering effects!, we also suggest that you sweep the dust and debris every day or as often as necessary. Then as needed wash the floor with water and a bit of ammonia. We don’t recommend using any soap because it can build up, leaving a slippery film on your floor. With maintenance , you will enjoy your beautiful metallic floors for years to come. However, if you think a metallic pearlescent coating may be a bit too time-consuming for you, then we would recommend an easier epoxy coating such as a full chip polyurea coating. 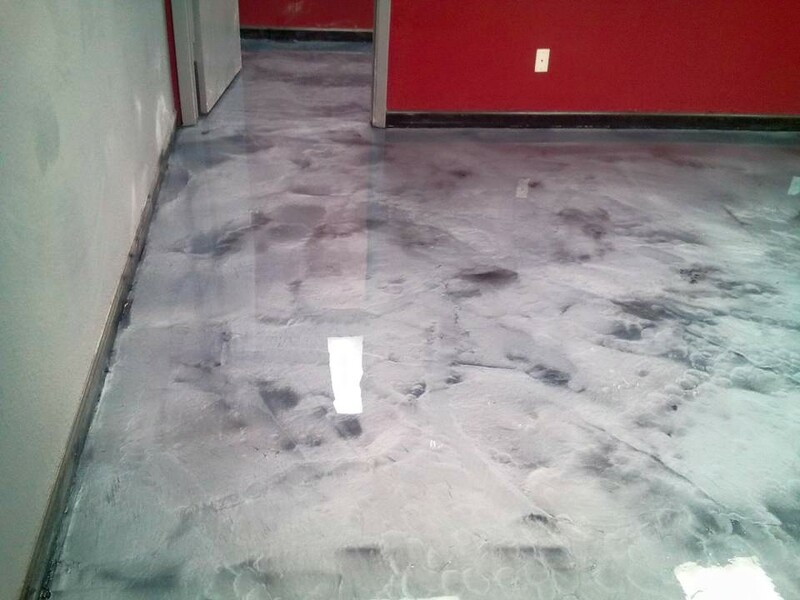 If you have any other questions about metallic epoxy flooring, or any of our floor coatings or acid washed concrete, please don’t hesitate to contact us, we are happy to chat with you about it! Dreamcoat Flooring serves customers ALL over the Valley such as Peoria, Glendale, Phoenix, Scottsdale, Mesa, Chandler, Gilbert, Tempe, Fountain Hills, Gold Canyon and Buckeye… so please give us a call today at 480-226-4172.